Everyone who wears watches knows the value of a good tool watch; a watch that you feel comfortable wearing no matter the circumstance, a watch that you feel confident will endure. Think of it is your default or go-to watch; that watch that when you wake up in the morning and don’t have time to fuss about, you just grab, because you know that it is reliable, speaks to your style and is just a pleasure to wear. For me, the Seiko 5 SNK series are ideal for this purpose. Their military looks are timeless, they are designed to be functional but manage to be fashionable and they are very versatile. Also, they are exceedingly affordable. 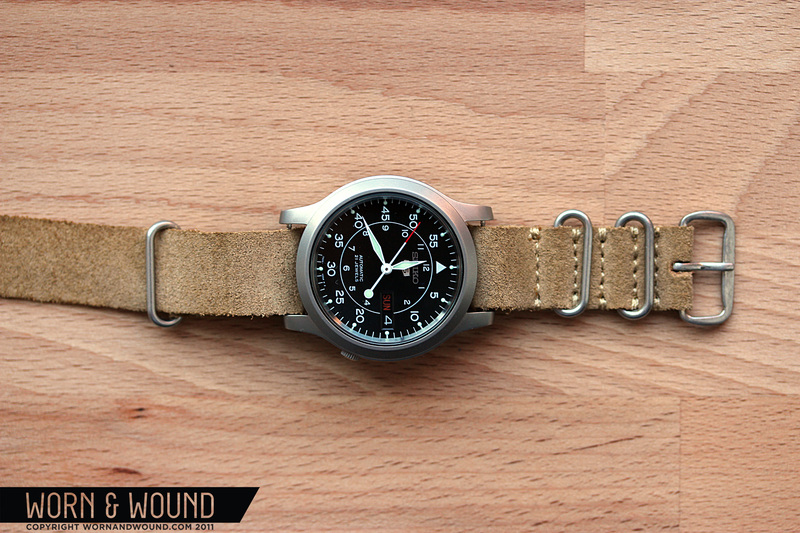 I wrote a review of the SNK803 several months ago, so I will defer to that for the various details about the watch. What really matters is that ever since getting the 803 I’ve wanted to get the SNK in another color, namely the snk809 black dial model. So, I toyed around with that idea for sometime, and then one day I was browsing Amazon and I noticed that price of the 809 was down to an astonishing $55 dollars…. Let that sink in for a second. It is hard to find a mediocre looking quartz for that price, let alone a good automatic watch. So I bought it right then and there. Inspired by the good price, I decided to spend a little more and pick up a J.Crew suede NATO, as I felt the light beige/sand color would make the black dial and bead blasted finish just sing…and, it does. Unfortunately, it is also a piece of junk (sorry J, got to be honest). It is paper-thin and frail, so thin in fact that it slips right out of the metal loops you weave it through to contain the extra strap. After wearing it for one day, the sizing hole I put it on has distorted and stretched to twice its original size. I wouldn’t even want to know what would happen if it got wet. Honestly, I don’t think the strap would last through a week of continuous use. It looks great on the watch though, which makes the unfortunate quality all the more disappointing. That being said, the 809 is a total success. I love it, and I love having two SNKs to alternate. The price of the snk809 has risen to a whopping $63, still making it an immensely affordable watch and a great value. Now, without further adieu, here’s the point of this post…a gallery of my two Seiko 5 SNKs.